8/24 Cup of Coffee: Mookie Betts was again the story on the farm, as he somehow managed to outdo his stellar performance from Thursday in Salem's big win on Friday. Elsewhere, affiliates were plagued by tough losses and a lack of offense, as Pawtucket, Portland, Greenville, and Lowell combined to score five runs on Friday. There was not much to cheer about in the Pawtucket Red Sox' 4-1 loss to the Scranton/Wilkes-Barre RailRiders (NYY) Friday. The PawSox only run in the game came in the ninth inning off the bat of Justin Henry, whose two-out RBI single scored Jeremy Hazelbaker. The RailRiders jumped out to an early lead on the PawSox, scoring two runs in the second inning. Starter Charlie Haeger allowed seven hits and three walks in six innings, which led to three runs for the RailRiders. The Portland Sea Dogs also took one on the chin from a New York Yankee affiliate, losing 3-1 to the Trenton Thunder (NYY). Sea Dogs starter Matt Barnes lasted only four innings and gave up six hits and two walks that resulted in three runs, only one of which was earned. After a strong July in which he posted a 1.74 ERA, Barnes has faltered a bit in August, producing an ERA of 4.12 in four starts this month. While Barnes was not particularly sharp, there was not much support offensively, as the Sea Dogs managed to muster across only one run on seven hits. Shannon Wilkerson picked up the team's lone RBI on a single in the sixth inning that scored J.C. Linares. In the Salem Red Sox' 18-5 rout of the Myrtle Beach Pelicans (TEX) Friday, one stat line stood above the rest. Second baseman Mookie Betts continued to turn heads with his performance at the plate, going 5 for 6 with two home runs, four runs scored, and seven RBI. The cartoonish stat line is becoming strangely routine for Betts, who was coming off a 4-for-5 performance the previous night. Betts wasn't the only Salem Red Sox player who impressed Friday, as both Sean Coyle and Keury De La Cruz homered as well. Coyle, who led off, already has 12 home runs for Salem in just 180 at-bats, while Cruz, who went 3 for 5 with four RBI, picked up his ninth long ball of the season. Another notable performer was catcher Blake Swihart, who went 3 for 6 with two runs scored. The Greenville Drive's comeback on Friday fell just a bit short, as they lost 4-3 to the Lexington Legends (KC). Trailing 4-1 entering the ninth inning, the Drive were able to jump-start a comeback on a triple by Jesus Loya that scored Reed Gragani, who was struck by a pitch earlier in the inning. Loya would score on a sacrifice fly, but that was all the Drive could muster as Tim Roberson struck out to end the game. The Lowell Spinners fell to the Hudson Valley Renegades on Friday, 6-0. The game was won and lost in the second inning, as the Renegades put up six runs on Lowell starter Daniel McGrath. McGrath would settle down and pitch through the fifth inning, but the Spinners had no answer offensively and were shut out by the Renegades pitchers. 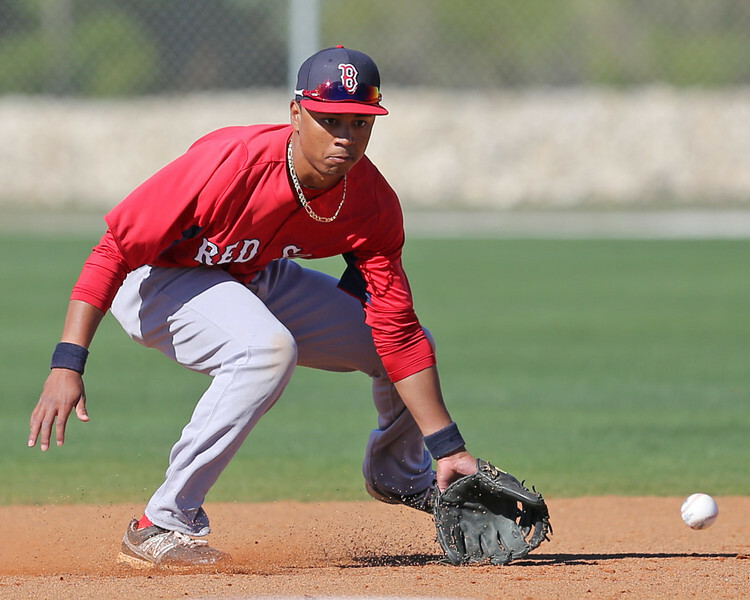 The GCL Red Sox took home a 2-0 victory in Friday's tightly contested game against the GCL Twins. Four GCL Red Sox hurlers, led by starter Jake Drehoff, combined to throw a three-hit shut out. Drehoff, who struck out three in three perfect innings, was followed by Pat Goetze, Luis Ortega, and German Tavaras, who combined for six scoreless innings in relief. The DSL Red Sox fell to the DSL Rays on Friday by a score of 6-2. Red Sox starter Yankory Pimentel surrendered five runs in 4 2/3 innings pitched, raising his season ERA to 2.62. While the DSL Red Sox were only able to scratch across two runs, they did string together nine hits. Four of those hits came off the bats of Luis Yovera and Luis Benoit. Yovera went 2 for 4, while Benoit was 2 for 3. Player of the Day: How do you outdo a 4-for-5 performance? Easy: go 5 for 6 with two home runs and seven RBI. Mookie Betts continued to build upon his ridiculous hot streak Friday. In his last two games alone, Betts is 9 for 11 with three doubles, two home runs and nine RBI. After struggling a bit during his promotion to High A, Betts has show an ability to make adjustments, batting .410/.476/.687 in August.